Your website matters. About 70 percent of people learn about a company by visiting their blog, rather than reading their online ads. The single most powerful thing you can do to reach potential customers is to provide consistent, helpful information on your site. Making your website the absolute best it can be takes ongoing effort. However, there are times when you want to improve your site now. Perhaps your traffic dropped recently, or a competitor is stealing away your customers. Whatever your reasons for upgrading your website, if you want to get a jumpstart on the process, these 12 UX tips will help. Users prefer newer material, and you want those new blog posts to get the traction they deserve. One thing you can do to improve user experience is to use relative timestamps on new posts, then switch to absolute timestamps after a week or so. So, a relative timestamp would state you published a post two days ago, while an absolute would show you published the post on a specific date. That allows the user to see when the post went up without having to do a bunch of math to figure out exactly how old it is. While aesthetics are certainly important, don't focus so much on the look of your design that you fail to make it usable. There are some tried-and-true things you'll want to focus on, such as making sure all buttons work, links go where they should and forms function. The last thing you want is to frustrate your site visitors with a site that doesn't work correctly. eWedding does an excellent job of making sure everything is simple and functions the way it should. If a user lands on the page, the choices of where to go next are limited, and each of those buttons works perfectly, taking the user right where the button says they'll go. While it's important to poll your customers and figure out what they want, sometimes they will say they want a feature and not use it. Take time to study heatmaps for your site and figure out what features users are and aren't using. There is little point in adding a specific guide that takes you endless hours to maintain if only one of out every 10,000 visitors looks at it. You're better off investing your time and resources elsewhere. Heatmaps also show you which features people use most often and allow you to create similar resources for your users that will give them what they want. Heatmaps show you where to focus your energy. If you sell a product that appeals to a diverse audience, you should add filters so the site becomes somewhat personalized for your visitors. Rather than having to browse through every product you offer, visitors can narrow down their search by those filters. You'll see this feature often on clothing sites, where you can sort items by type of clothing, color and even by features such as long or short sleeves. 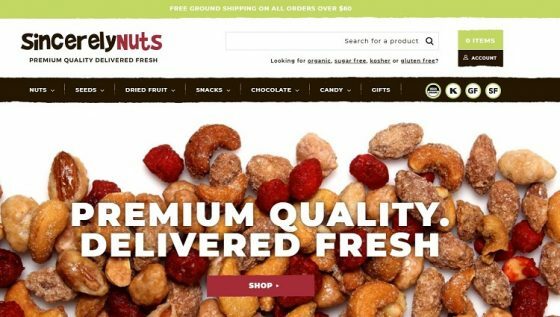 Sincerely Nuts is a good example of an e-commerce site catering to a diverse crowd. Filter the products on the site by gluten-free, sugar-free, vegan or kosher. You can also browse by type of food, such as nuts, seeds, dried fruit or candy. Apply just one filter or multiple filters to go directly to the product type you're seeking. Around 61 percent of shoppers state they've abandoned a cart because of extra costs, such as shipping fees. There are many reasons shoppers might abandon a cart. Perhaps the checkout process takes too long. Maybe there were unexpected fees, such as the shipping costs mentioned above. The shopper may have had a coupon code that didn't work, and they became frustrated. Take time to study interior analytics and try to figure out where in the process you're losing customers. To improve your checkout process, you first have to figure out why people abandon the cart. You may have to try a variety of tactics to reduce your cart abandonment rate. Offer free shipping over a certain order amount and give the user reminders of that discount throughout the shopping process. Send a follow-up email when someone abandons a cart. Offer a discount of 10 percent or so. Try different tactics to improve the process. Attract holiday shoppers by adding seasonal detail to your website. It doesn't have to take a lot of time to add something quick and simple like some fresh seasonal images or a logo that features the season. Google is an excellent example of tying your site into a holiday. Google occasionally changes up their logo to commemorate a special occasion or to celebrate little-known holidays or people throughout history. Chipotle doesn't do anything time-intensive when changing up their website to show off featured seasonal menu items. Instead, the images change only slightly from season to season. However, they do reflect current offerings, and the images are vivid and mouthwateringly delicious-looking. One key, if you swap out images, is to use ones that are highly professional and relevant to your page. Every site has posts that don't perform well. Perhaps the topic is outdated, or maybe you have since hired a professional writer to help with your content. Whatever the reason, look at the bottom five or 10 posts on your site as far as traffic or bounce rate and consider ways to improve them. You'll have to decide if it's better to edit them, or delete them entirely. If you want to increase conversion rates, make information on your products and services as simple to find as possible. Provide multiple links to that info. Add descriptive details on the product page. Provide a video that outlines what the product does and its many features. Anything you can do to put information in consumers' hands more easily improves the overall user experience. About one in every three consumers walks away from an online purchase because they can't find the information they're looking for. Think about the last time you visited a website on your smartphone and had to enlarge the screen just to click on a link. If you're like most users, you walked away feeling frustrated. One of the most powerful things you can do for your website is to make sure it is fully responsive to different screen sizes. That means the text is large enough for the user to tap with a finger and go where they want to go. If you run a WordPress-based site, you can install an app that will handle some of this work for you. If your design is HTML5, you may need to do some tweaks and offer different versions of your site for mobile and desktop. Obviously, that will take a bit longer than an hour, but in an hour, you can figure out which elements need improving and make a plan to move forward. Seventy-three percent of consumers say they leave a site if the images take too long to load. First, make sure to optimize your images. A variety of free software choices allow you to condense the size of your image files and optimize them for web use. If your images still load too slowly, reduce the number of images on the page or seek out a CDN system to deliver the images more efficiently. Don't rely on your favorite cousin to test your site and tell you all is well. Go the extra mile and use remote UX testing to ensure everything works seamlessly for all your visitors. You'll have to invest in remote usability vendor services to track how real people in their home environments interact with your website. The investment will pay off in higher conversions and better site usability, so it is well worth the cost. An hour is a good window to improve your site's navigation. Over time, navigation needs change as your site grows. Study the options your visitors see as they land on your page. Are the most popular areas of your site the easiest to navigate to? Can you improve anything? What about mobile versus desktop navigation? Don't be afraid to use a hamburger menu if needed. Tweaking your navigation should be an ongoing process. Improving your website should be an ongoing task. Spending an hour here and there makes a big impact over time. Start with the 12 tips above and then expand into other UX areas. Before you know it, your site will more than outshine the competition.